This week we have Disney’s latest live action remake coming out. 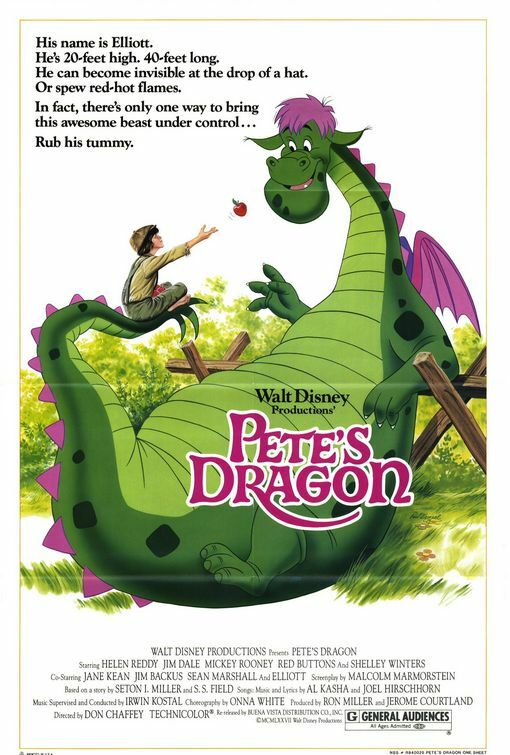 It is a very loosely based retelling of the 1977 film Pete’s Dragon. I’m actually looking forward to this remake. The early buzz is great, and I’m excited to see what indie director David Lowery can do. Evidently the working environment was great because Disney has already hired him to work on their Peter Pan remake. He has a passion for the project and if Disney is going to do remakes (which I wish they wouldn’t) I’d like them to pick auteur directors with unique perspectives and ideas. Since I have never reviewed the original on my blog I thought I would give some of my thoughts. I know for many it is a special film but for me it isn’t one I grew up with or even recall watching as a child. In fact, when I heard they were doing a remake it made a lot of sense to me. In general I prefer remakes to be done of movies that are decent but could be improved rather than masterpieces like Sleeping Beauty. 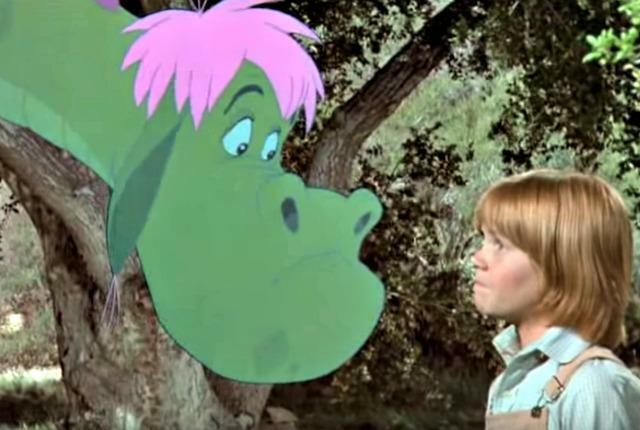 Pete’s Dragon is cute but it’s pretty hokey and doesn’t really impress me that much. 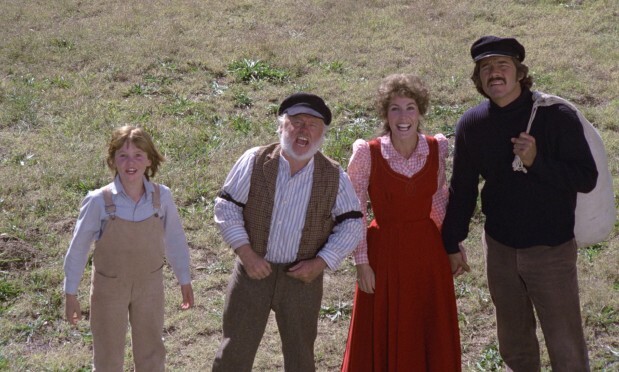 The story of Pete’s Dragon is pretty simple. It’s about a boy named Pete who has a dragon named Elliot. Elliot is an animated creature and the rest of the movie is in live action. Pete loves Elliot because he is an orphan owned by a horrible family called the Gogans and Elliot is his only friend. While the Gogans are searching for Pete, they go to a village named Passaamaquoddy and meet a man named Lampie who has a daughter named Nora. Nora’s fiance Paul has been reported lost at sea, so she is naturally very upset. Then we get our villains Dr Terminus and his stooge Hoagy and they want to use Elliott to make potions and elixirs to make money. They are your typical sniveling over the top silly villains. 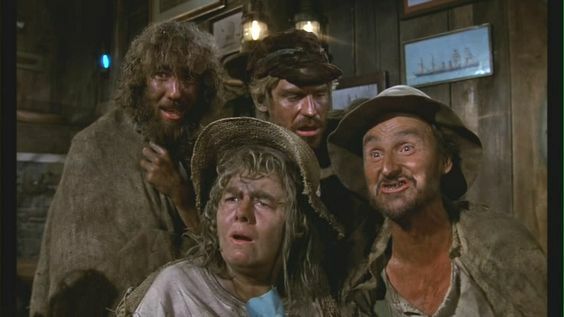 The rest of the movie is basically a cat and mouse chase between the villains (Gogans and Terminus/Hoagy) and the good guys (Pete, Elliot, Nora, Lampie and Paul). 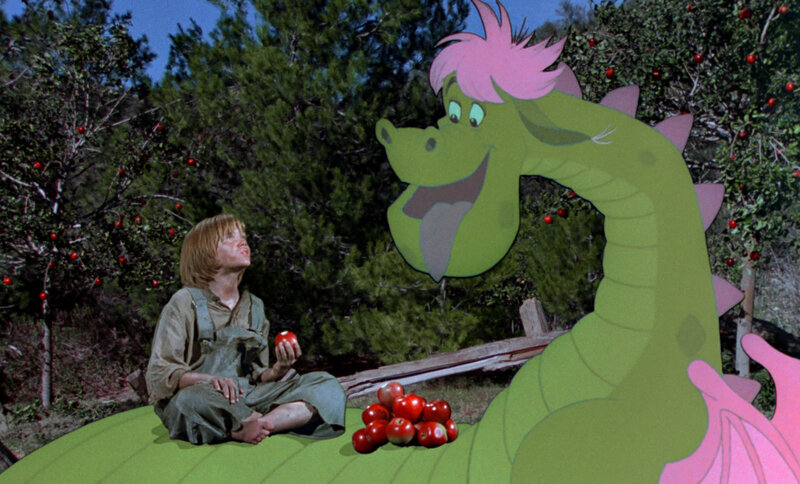 Pete’s Dragon is perfectly harmless entertainment. The songs are fine but aside from Candle on the Water forgettable. The performances are all nice. The animation of Elliot is first rate. It has its heart in the right place. It’s very sweet enjoyable film. There is a lack of cynicism to the entire enterprise that is very charming. However, I don’t know if I would say it’s a particularly good movie. The villains, particularly the Gogans, get old very fast. They cross over the hokey line and become out right annoying. Plus, it is strange to have a Disney movie where a character is continually claiming she has the ‘bill of sale’ to a human being. Isn’t that strange? Dr Terminus and Hoagy are sniveling snarling mustache twirling villains that are fine but don’t do much to inspire me or excite me. Pretty standard rote bad guys. Like I said, the songs aside from Candle on the Water are nothing special. 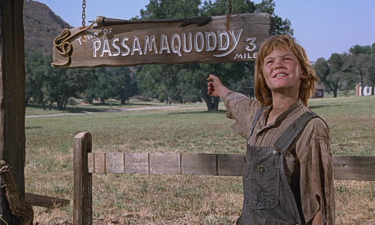 Let’s put it this way Passamaquoddy isn’t likely to be the next Supercalifragilsticexpialidocious. This music sorely misses the Sherman Brothers. They could do so much with a song like Brazzle Dazzle Day. As it is it’s meh. The animation is pretty good on Elliot and he and Pete have a sweet relationship. I also appreciate we don’t get any real backstory on Elliot. He just exists and that’s the way it is. I certainly would put other live action Disney films like Mary Poppins, Pollyanna, Bednobs and Broomsticks, Parent Trap, 10,000 Leagues Under the Sea, etc far above this. 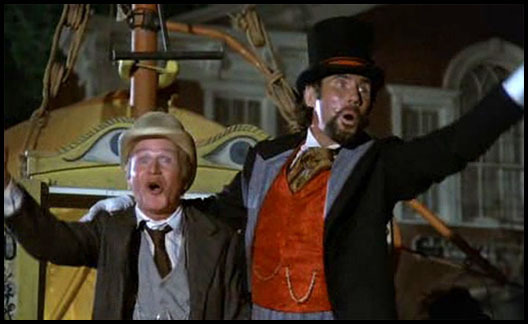 I even think Chitty Chitty Bang Bang (not Disney I know) is much better. They are for the most part more engaging and less syrupy than Pete’s Dragon. But there is stuff to like here and aside from the Gogans nothing to really offend or annoy me, so it’s not a bad watch. It’s fine. Okay, Pete’s dragon is not Mary Poppins or 20000 Leagues under the Sea, but I really love that movie…or, to be precise, I love the GERMAN cut of the movie, which is no less than 20 minutes shorter than the English cut, which has a really drawn out pacing which imho hurts the story. Like Bedknobs and Broomstick the movie is better if you go a little bit lighter on the musical numbers…..
To clarify the reason why the German version is so much shorter is mainly because it cut down on the musical numbers (which I enjoy way more than you do, btw). There is no “Happiest home in the Hills” (which I guess wouldn’t have minded leaving in, but without it, you have less Gogans, ensuring that they stay entertaining through the whole movie because you don’t get an overdose on them in the first minutes, plus, the song doesn’t add much you wouldn’t learn in the superior “Bill of Sales”). And Candle on the Water is also cut, which might be the best decision of them all. I agree that it is the best song in the movie, but it also puts the plot to a grinding hold when the movie lingers for minutes on Nora standing on the lighthouse singing, with nothing else going on at all and, again, only establishing what we already known. In the German version the song replaces the instrumental in the beginning, this establishing the theme of “finding your way home – or to a home in Pete’s case” from the get go, and when Nora explains who Paul is, it fills some details to something what the audience learned earlier in a very settled way, instead of Nora first explaining Paul and then spending ages to tell the story again to the wind. In addition the German voice actors are very good and elevate what is a passable performance from the child actor and the singer who played Nora (who should have stuck to singing), which in turn elevates the songs, too because there is way more passion put into the lines, especially in “Bill of Sales”. So, all in all, I get it when Americans dismiss the movie because not only did they get and overly long-winded version of the story in which the focus on the songs often drowns out the more heartfelt elements, but also mediocre performances from what passes as main actors in the movie (well, outside of Rooney and the villains). But I also think that they overlook the gem beneath it. Not excited about the upcoming movie, btw. Based on the reviews it sounds like Mowgli with dragon, and that is not what Eliot is about. For me the focus should be on the dragon who tries to help this little kid, but often makes his life harder without really meaning to do so, as well as the concept of the “good society” vs truly good people (yeah, it is strange to have the Bill of Sales wording thrown around so much in a Disney movie, but this is kind of the point. The “good town people” who are holier then themselves dismiss Pete for being poor and treat him like dirt, blissfully ignoring the questionable nature of the Gogans as well as being ready way too fast to kill a dragon because of superstition, while the “drunkard” who lives in the lighthouse and his daughter are the truly decent people in the story. Interesting perspective. I didnt know that about the German version but those do sound like good changes except for Candle on the Water. I dont really mind if songs don’t move story forward in a musical as long as I like the song. I dont hate the movie. It’s fine but to me nothing super special. But I suppose I didnt grow up with it and some of the hokey elements are harder to swallow for the first time as an adult. The economic class themes you speak of didnt really move me or make me think but if they did that for you that’s cool. I guess I would mind the placement of Candle on the Water less, if there was anything actually happening on screen doing it. I guess you also have to see the movie a little bit in context. It is fairly old, after all, and if you forget that all the superstition and fear is about a dragon and replace it with “something vaguely foreign we can’t see” there is a very settled commentary on the fear of the foreign in it. There is Doctor Terminus, who is an outsider and clearly a bad guy, but he gets accepted because he is able to do and say the right things. And then there are Pete and Eliot, who don’t have the abilities and put the town in a frenzy, even though both are mostly interested in endearing themselves to everyone they meet, but they don’t have the right look and seemingly nothing to offer, so they get dismissed. It is very settled, but I would have liked Disney had explored this angle for the remake. I can see that take but I guess it’s wrapped in such broad campy performances like Terminus is such a mustache twirling bad guy that I think it dominates the screen. It’s an interesting perspective though. To me Terminus reminded me of a low grade Harold Hill from Music Man. He talks a slick talk but was more obviously a villain than HH. It’s easier to discount a little boy especially when he’s talking about an invisible dragon. That said Nora and Pete have nice moments and I liked the story of her and her fiance. That was more heartfelt than the silly villains. Like I said I dont hate the movie. It’s cute but just not a favorite of mine. Yeah, I know, it sounds like a thoughtful movie. But it doesn’t really sound like Pete’s dragon. That’s certainly a fair criticism. I’ve never seen this version, but I want to before I watch the remake! I had no clue what this movie was even about until I saw a recent trailer. They both look like they are going to be great viewing experiences, so I’m quite excited. 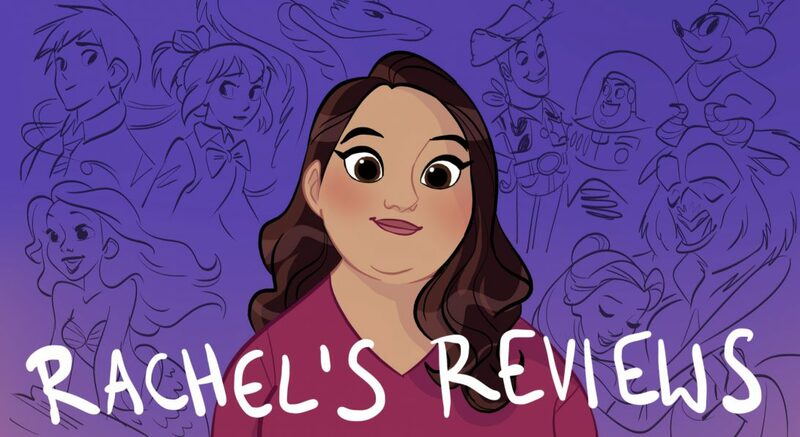 I love that you did a review right before the new one comes out! Yeah, I think this movie could have been better and gave it a much lower grade on my blog. Candle on the Water is the best song definitely. I didn’t really think there’s anything strange with the “bill of sale” for a human. It seemed funny enough in the context of the film and led to an interesting song, lol. It’s no “virgin mentioning” a la “Hocus Pocus”, lol! I never really grew up with it either so I grabbed a copy of this one from my library to watch. I haven’t gotten around to it yet but hopefully will soon. I’m actually going to see a pre-screening of the new one tonight so unfortunately I won’t be able to watch the 77 one beforehand, but I’m looking forward to the new one!